Invite other users to your Unlockr panel to access and place orders with the same store account as you. Which means that they will see and use the same account balance. Login to your unlockr account and navigate to settings from where you can click the Staff management tab. The settings can be accessed from either the cogwheel in the botton left corner, or by clicking your user account icon in the top right corner. To invite a user simply click the blue invite user button and enter the email address of the user you want to invite. 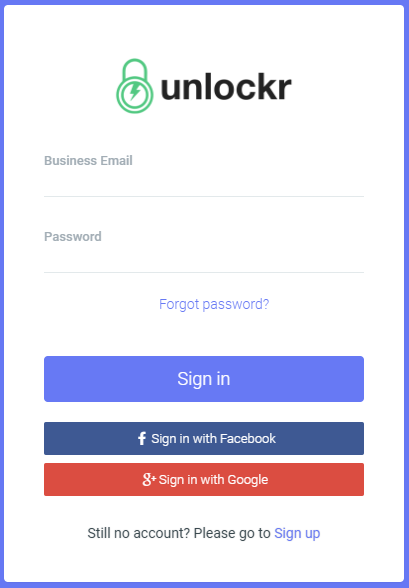 Tell the user to open the login screen and click Sign up to complete filling the user details such as name and password. You will be able to change the user permissions once the user has logged in for the first time. Staff : Regular staff users will see MSRP prices for all services and are restricted from topping up the account as well as most configurations. A Store manager will have full permissions like the main user of the Store account.